C-USA TV schedule is out!!! No link yet but FAU Navy will be on a Friday night!!! BOOOO I hate non-saturday games. But it is good for exposure. 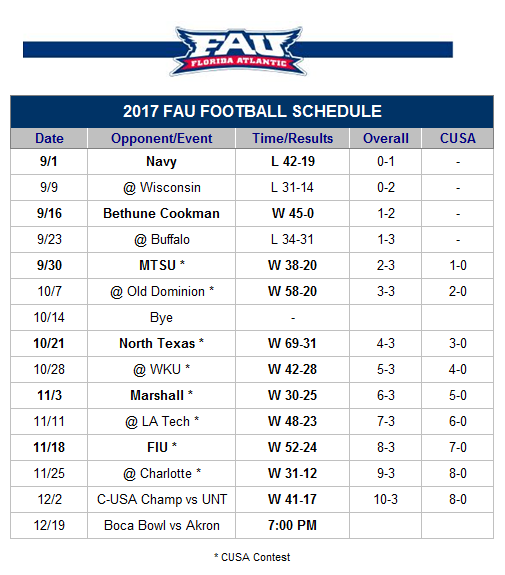 Yes its about exposure-FAU-Navy is now the most interesting game on Friday night the 1st and will get lots of coverage. On Saturday Night the whole college football world is going to be watching Alabama-FSU and we would have been an afterthought. This is a great move for FAU! Oh well, at least everyone will see Navy put up 500 yards against us. This is such great move for so many reasons. If your team isn't playing Friday the entire college football world will be watching. This will be our highest rated game ever. 2. Early in the year in south Florida many high school games are played on Saturday's as well so it's a no win there. 3. Wisconsin plays on that Friday night as well vs Utah State. This gives each team equal time to prepare. Every should go to their boss right now and say "Hey I am not coming in Friday the 1st" I already did it. I love it, I love the stadium at night and now I have all day Saturday to watch other games and of course the exposure is huge for us.